Again this week a major Fullers ferry has been taken out of service for some unknown reason: passengers don't need to know why or how long, we just need to keep stumping up, keep our mouths shut and be grateful there is a ferry service at all, what with Infratil being kept busy with chasing Auckland Airport directorships. So we now have endure rides on that crowd favourite, the Vomit Comet, sorry, Jet Raider. Not that it would matter much if only they could get rid of the diesel fumes above and the toilet stink below the waterline. But the constant lateness of the damn thing is what riles most passengers. Fullers has been posting notices around patronizingly warning passengers that their ferry won't wait for them at departure. Unfortunately there is no same guarantee offered it will ever arrive on scheduled time and the Jet Raider is always 15 to 25 minutes late. In the UK, public transport operators get fined or their licence withdrawn if their services are habitually late. Why can't we have a similar system here? It would certainly them where it hurts and make haste of regular maintenance and upgrades. Stranded on an island again? 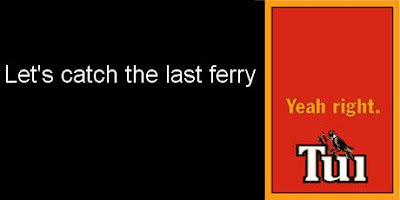 Another party weekend is upon us on Waiheke and Fullers have been putting up posters on the ferry "advising" party goers to return on the 8.15pm and 10.15pm ferries. The only proper response is a Tui ad. But it shouldn't be rocket science, really. Why not run an all-night boat, say, every two hours, so party goers can relax and enjoy themselves in the knowledge they can get back home at some stage? Basic good customer service and what a ferry service should be there for, I would have thought. Let's hope the Red Cross is ready this time with blankets and hot drinks for the stranded. "It has emerged the skipper of a ferry that last weekend left over a hundred passengers stranded on Waiheke Island, had refused to return for them. The passengers couldn't all fit onto Fullers' last sailing. The company says it's looking into why the skipper ignored a manager's request for him to make another trip. And he says Fullers is making sure visitors to the Island's annual food and wine festival today are well catered for." The gossip I heard on the ferry home last night was that some of the crew on the last vessel that night refused to return to Waiheke to pick up the rest of the passengers because in a previous instance last year they were not paid by Fullers for the overtime they put in then. So, if true (if Fullers management reads this, please feel free to clarify the issue), the complete fault lies with Fullers management, and not with the crew in question. Nobody is obliged to work for free, surely. "Listed infrastructure investor Infratil could exit its $250 million bus and ferry services if radical transport proposals are pursued by local government. Infratil director Tim Brown said the proposals would ultimately see the country's bus and ferry networks run by bureaucrats who would collect the fares and pay private operators a fee to provide the service. They would also have the right to buy the business if it did not meet local authority targets." It's not often Waiheke Island makes the front page of the largest newspaper in New Zealand two days in a row. The last time was when the foot & mouth hoax hit. "When most of the people choose to come back on the last sailing it makes it a little difficult." Well, bugger me, Fullers, I know you like that, but isn't providing passenger services what you are actually in business for? Now a few people face charges for "breaking into" the wharf building, because they were cold and hungry during their 8 hour wait overnight. Well, duh! Our famous island hospitality has been severely dented by this incident. At least the wharf building should have provided shelter - isn't that what it was built for? Every ticket sold by the ferry company includes a "wharf tax" so technically speaking they didn't break in but gained access to what they had paid for. On the second day after the incident, Auckland Regional Council leader Mike Lee waded into the issue calling the ferry company excuses "nonsense". Pity the ARC has little power over Fullers because they run the Waiheke service as a pure monopoly without local body subsidies, which means they are un-beholden to any conditions on service and quality delivery, timetabling and fare structures. A pure capitalist text book case of bugger the customer for all he's worth. Despite all this fun and nonsense, there is really a serious issue involved. Our island is basically dependent on its 1,000 daily commuters and the hordes of tourists who visit irregularly. All have to use Fullers Ferries who happily gouge whatever dollars they can get out of us and you (you can come on another ferry service from a suburban part of town but this is impractical). And if this suddenly becomes uneconomic our whole island economy will be far more affected than any foot and mouth disease can throw at us. "This is not the normal culture of a business that runs a public service; it is not even the culture of state-owned service providers these days. Fullers' behaviour last Saturday night was a throw-back to the days when so-called public servants would close the counter on a queue of customers if the clock struck closing time." Indeed, and even writing letters to Fullers results in patronising and nonsensical replies, but which you're not allowed to make public!